A customer rang us shocked last week after receiving a fine over $400 for having his dog unrestrained in the car. Whoah… what a budget buster! And don’t forget the 3 demerit points. We sorted him out with a dog restraint quick smart. That fine is unpleasant at best, but it’s good to see that our government cares enough about us and our dogs to treat this issue seriously. Since 2013 it’s been illegal across Australia to travel with a dog which is not fully under control. If you thought this law wasn’t being enforced, think again. Go out with your dog untethered on the back of your ute and you can get an on-the-spot fine of $500. What’s more… if an animal suffers an injury as a result of being unrestrained you’re also liable for a fine of up to $5500 under the Prevention of Cruelty to Animals Act. And add a bonus of 6 month’s jail time for bad behaviour! See, they’re aren’t kidding about this. But we aren’t complaining about fines. We are applauding the safety! The obvious one is that you love that little mongrel! Dogs are just as vulnerable to the impact of collisions as we are. Restraining your dog keeps that beloved canine safe. What happens when Fido, a robust labrador, jumps onto the driver’s lap, barrels his head out the window and puts the hard woof on an unsuspecting german shepherd? One word. Chaos! Unrestrained dogs can be visual, auditory and physical distractions that trigger entirely unnecessary accidents. Picture the sudden impact of a collision. You and the kids are still safely secured by seatbelt. But your unrestrained 20kg staffy pup is thrown careening into the front on impact. According to the NRMA: “If you’re driving 60km per hour with an unrestrained 20kg dog in your car and it gets thrown onto you, the impact is the same as if it had hit you from a third-floor balcony.” OUCH!!! Maybe you don’t have up to $6,000 disposable income and 6 months of free time that could be better spent in.. um.. jail. Here are the ins & outs of our car harnesses & restraints so you can make the best choice for your pack. Ruffwear is like the Paddy Pallin of canine gear. This dedicated canine seatbelt was designed for your dog’s safety and comfort upon demand from Ruffwear’s loyal customer base. During development iterations of this harness were crash tested dynamically in 3 tests, with different weights for the different harness sizes, until the harness performed as intended. You can actually see the the crash test videos here. The Load Up is a bit more dear than some other options, but Ruffwear products are built for the long haul and the peace of mind you’re purchasing is priceless. You’ve got a super safe car harness that’s comfy for extended wear. 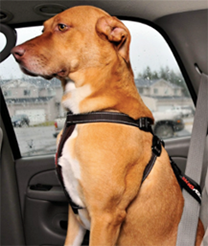 To use the harness you fit it onto your dog and then thread a seatbelt through a loop on the back. Or you can use it with the EzyDog Click Car Restraint (see below) to give more wiggle room to your dog. If you’ve ever taken a long walk in 40 degree heat you’ll probably agree that there are times when less harness is more harness. 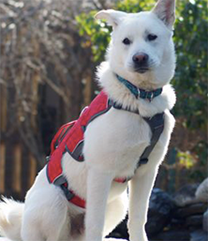 The EzyDog is a lighter harness with less body coverage. 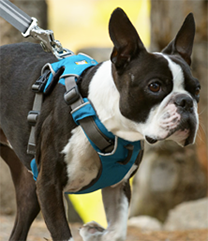 If you’re looking for a secure harness that meets your needs both in the car and on walks this is a solid choice. 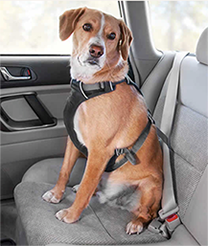 While it hasn’t been crash tested it will definitely provide support and restraint to your dog in your vehicle. The chest plate portion sits on your dog’s underside and is more supportive than your standard harness. 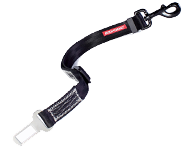 This harness comes equipped with a removable swivelling car restraint which is essentially a small loop where you can thread your seatbelt through. I’d recommend using this harness with the EzyDog Click Car Restraint (see below) though for more wiggle room for your dog. 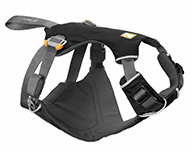 The Front Range Harness is s structured, padded harness which I frequently use in the car. I love this harness because it’s pretty schmick; it’s a great walking harness; and it provides plenty of support for the car. Pluto finds it quite comfy. It has the added functionality of a clip on the chest where you can attach your lead (as well as the standard one on the back). When you use the front clip your dog will turn himself around while pulling. It’s designed to reduce pulling and works brilliantly as a pull deterrent. Use with the EzyDog Click Car Restraint (see below). 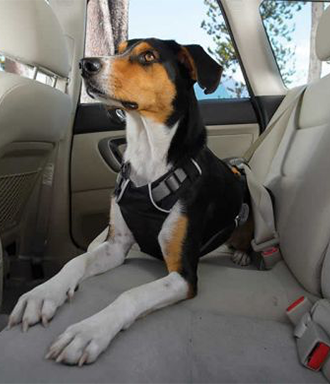 The Web Master has plenty of structure to keep your dog well fastened in the car. If you’ve got a Houdini dog, this harness will outsmart him! It’s a lightweight harness with a yoke in the front and 2 straps under the belly. No dog can escape! Another great feature is the handle on the back. 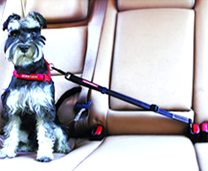 If you’ve got a disabled or older dog you can use the handle to help hoist them up into the car. Use with the EzyDog Click Car Restraint (see below). * In built handle so you can give your dog extra support. I prefer a bit of wiggle room for my mate so she can turn around and get comfortable. For shorter rides the built in restraint features of the Load Up or Chest Plate Harness might be fine, but for longer trips I’d want to use this adjustable tether as well. It clicks right into your seatbelt clip and attaches to your harness. Unless you have a Volvo. For some reason Volvos are fitted with a different size clip to all other cars. Sorry Volvo drivers! Your cars are really nice for everything else I’m sure. I find this EzyDog Click Car Restraint indispensable and really easy to use. Any questions? We’re here to help! best to answer any questions you may have. HAPPY TRAISL to your pack! Ruffwear: dog gear that stands the test of time! The secret to canine safety – walk on leads! December 11, 2015 | Filed under Uncategorized.